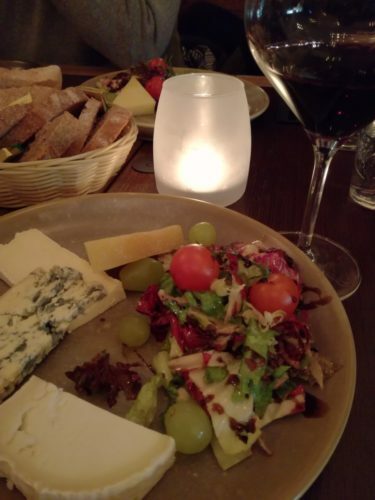 Vive La France and du Fromage et du vin! On a chilly but bright Saturday evening some friends and I ventured out to explore the Message from the Skies production which projects ‘love letters to Europe on iconic Edinburgh institutions. On the southside of The Tron we read Scottish writer, William Dalrymple consideration of the Scots’ historical relationship with mainland Europe, highlighting significant archaeological discoveries both at home and further afield to demonstrate the deep and long bonds that connect us – such as the red pantile roofs of East Lothian come from Rotterdam. Located on the ground floor of the Institut, the Bistrot and its friendly staff aim to provide you with an enjoyable, authentic, and delicious French experience, filled with passion and love in every action, every glass of wine, and every dish. Open every day from breakfast to dinner, Le Bistrot by Patisserie Maxime is a place where everyone can feel like they are in France without having to leave the fantastic surroundings of Edinburgh!